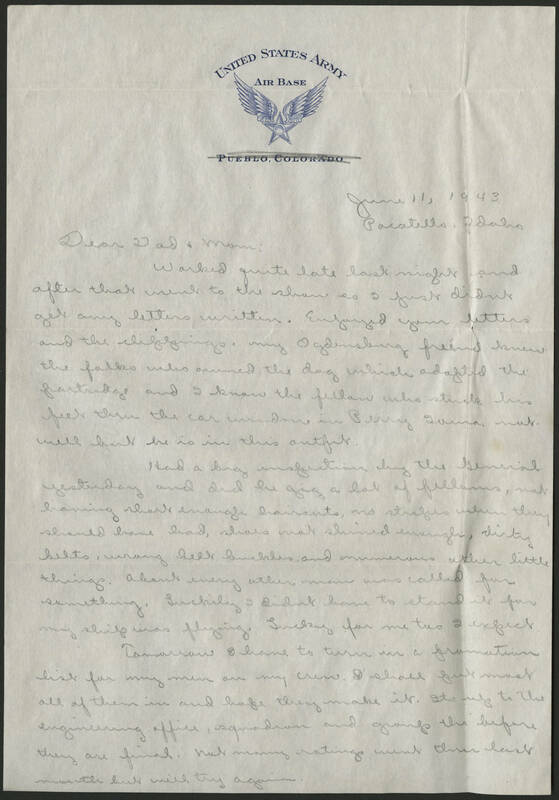 June 11, 1943 Pocatello, Idaho Dear Dad + Mom: Worked quite late last night and after that went to the show so I just didnt get any letters written. Enjoyed your letters and the clippings. my Ogdensburg friend knew the folks who owned the dog which adopted the partridge and I know the fellow who stuck his feet thru the care window in Perry Iowa not well but he is in this outfit. Had a big inspection by the General yesterday and did he gig a lot of fellows, not having short enough haircuts, no stripes when they should have had, shoes not shined enough, dirty belts, wrong belt buckles and numerous other little things. About every other man was called for something. Luckily I didnt have to stand it for my ship was flying. Lucky for me tho I expect. Tomorrow I have to turn in a prom9otion list for my mend on my crew. I shall put most all of them in and hope they make it. Its up to the engineering office, squadron and group tho before they are final. Not many ratings went thru last month but will try again.